We’re trying to ensure that each one of these tables is unique and one of a kind. We’ve been getting quite a few requests for these, and the last thing we want to do is bore everyone and ourselves. This one is kinda fancy. The White Diamond. Probably could’ve come up with a better name, but I’m exhausted…Here are the details. 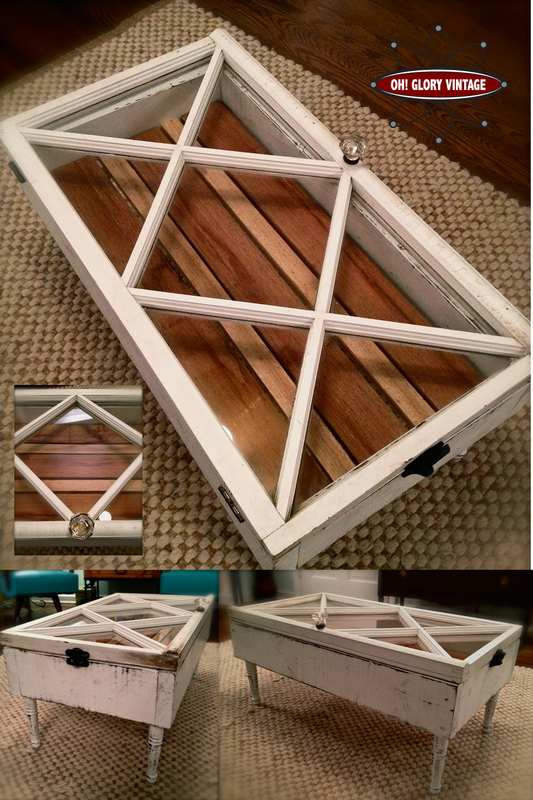 Coffee table made from a pretty rare window with diamond shaped panes which opens up for storage. Each one of these tables is one of a kind. The table itself is made from new 2″ x 6″ studs. Interior shelf is made of rough cut 1″x4″ and 1″x2″ cedar board in contrasting shades to add interest. All reclaimed hardware is used whenever possible, with the exception of new sash locks on both sides. This one features a vintage crystal door knob to make it super classy! 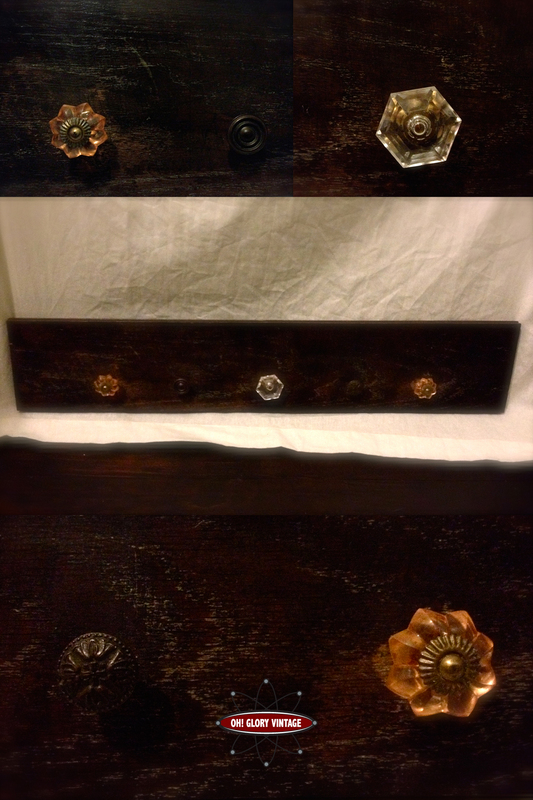 Coat or Hat rack made from a very old piece of reclaimed tongue in groove hardwood flooring from the early 1900s. The wood was pulled out of an old barn in Virginia where it had been for at least 20 years. It uses old door small door knobs and cabinet pulls as hangers. Center one is a clear vintage piece, the two outside are peach colored new (Pier One, haha) and the two metal ones were reclaimed from various antique dressers we’ve had. The original color of the wood has been preserved and hand waxed. Measurements are 32″w x 6″h x 1″ thick. $36 in our Etsy shop. 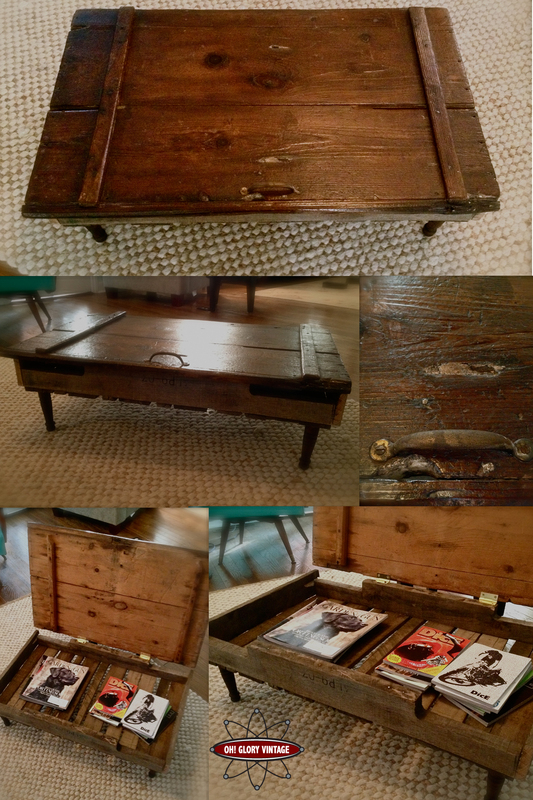 I picked up this really cool old barn access door from a flea market recently and thought it would make a nice top for a coffee table. It’s at least 100 years old. Nice patina, square nails and everything. The rest of the table was made by chopping up and old pallet. Designed so the cut outs in the pallet are symmetrical and add a nice touch. I didn’t want the pallet to lose it’s identity! The top door pull is old patina’d brass that came out of some old feed store drawers. Added some new brass hinges and legs. Size is 36″w x 22″d x 12″. SOLD.